June 2018 – Dc to a "T"
Wedding season is in full swing, but the “something old, something new” in this post title actually refers to…you guessed it…furniture styling. As you may know if you follow me on Instagram, I scored an awesome pair of cane chairs off of Craigslist this past Sunday for only $15 each! It was a dream come true (even though I had to travel pretty far out to the Virginia suburbs to grab them–though I took the metro one way and then Ubered back with them, though, so it wasn’t too pricy of an excursion). Side note: the seller had originally listed all five chairs for $75 total, and while it was a huge steal, I just realllllyyy don’t have the room for all of them. I emailed her asking if she was willing to break up the set (though keep in mind that some people are sticklers about not doing this), and luckily, she was, which made it super easy for me to head to her place and grab two (I also lucked out because not all of the chairs were in great condition, so I was able to pick out the least flawed ones). While I was excited about the chairs, I did worry that they were maybe a little too old-looking/grandma-ish for a 26 year old. I knew I could style them and make them look fun, but I wasn’t (and still am not) exactly sure how. I’ve tried placing my fun leopard print pillow on one and a faux fur throw on the other (which is cute, but also necessary, as the seat on that chair is pretty torn up). 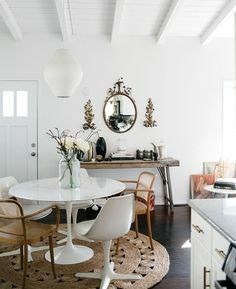 After browsing Pinterest and crowd-sourcing on Instagram, I’ve decided that while gold/white/black spray painted cane chairs look cool, the original wood finish is pretty special and worth keeping. (Sorry for the weird lighting in these photos–one was taken during a super sunny afternoon, and one was in the morning before work, when it’s also very bright in this spot!). 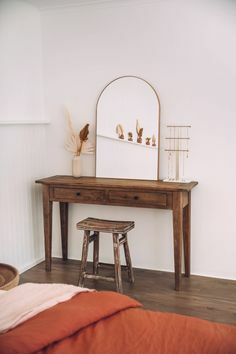 So how can I create a fairly modern setup with all of this wooden furniture? It’s all in the styling. I placed the chairs next to the cane love seat I have, which is obviously also old-looking, but the lucite tables next to them add a more young, modern look. 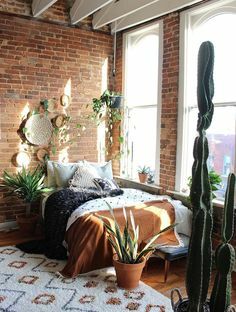 After all, I’ll only be in my twenties and living on my own/with a roommate for a limited period of time, so I don’t want to create a look that’s too “grown up” or stuffy just yet! 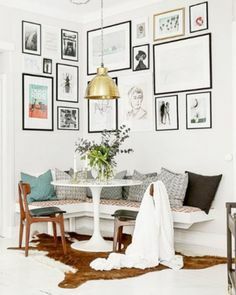 I think my gallery wall also helps offset the stuffy vibe–it’s filled with fun prints (some older-looking, and some more modern) that are colorful and whimsical. The gold lamp from Target is 100 percent young and modern-looking while also being functional. Plus, greenery is always key in making a room look more fresh and alive, literally! Plants are so easy to use as decor–just place one in an empty space and there’s no need to splurge on a side table. 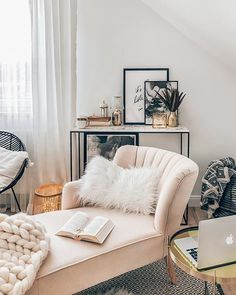 I also think a purely modern piece–like a fun moroccan pouf or Eames chair replica–does a great job of taking a space from granny to millennial. 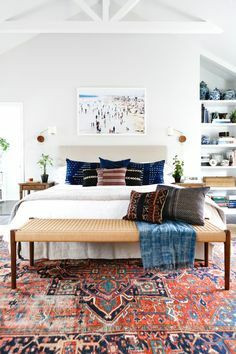 Mixing and matching vintage pieces with finds like these will go a long way! While I’m far from a DIY expert, I love knocking out a spray paint or sanding project in my spare time. It’s so satisfying seeing a piece of furniture go from blah to beautiful in a matter of hours. However, I’ve also started several projects that ended up being huge flops, and I know plenty of other people can relate! Here are some things I’ve learned from my DIY drama. 1) Patience is key. It may be tempting to start that spray paint project on a super hot or windy day because it’s the only free weekend you’ll have for awhile, but you’ll only end up more frustrated if you begin your work under less than ideal conditions. 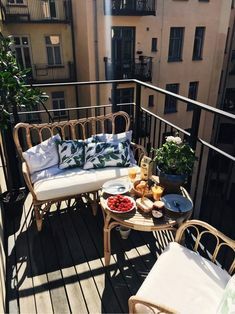 Check the weather (especially during the summer) to determine whether spray paint will hold or just end up all messy, and if you need to wait a few weeks, it won’t be the end of the world–you’ll thank yourself when your final product looks amazing! 2) Be realistic. I’ve done some DIY projects that I’m super proud of and others that have made me want to start crying! 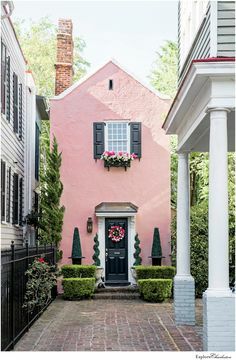 The end result likely won’t be as pretty as the images you see on Pinterest, so if you would feel more comfortable enlisting a friend or professional to help, do it. Even if you snag a cool vintage piece that’s seen better days for cheap and pay someone else to refinish and paint it, it will likely still be a better deal than buying a completed piece from the local antique shop. 3) Do your research. I’ve found that asking questions at the hardware store and doing some Googling can really help–it’s better to be safe than sorry, especially when purchasing your materials. 4) Painting over paint isn’t always a great idea. I’ve learned the hard way that painting over an existing paint color is super difficult and doesn’t always look great, even if you sand beforehand. As noted in the point above, do your research and figure out if the project you have in mind makes sense to take on, or if it’s better to leave a painted item as is and live with it. 5) Dress accordingly. It seems like a no brainer, but there have definitely been times where I’ve figured plastic gloves would suffice and of course ended up getting spray paint all over my jeans. Wear old clothes and cover your hands; you’ll thank me later! What DIY tips do you have? I’m more of a painter/refinisher but would love to hear what it’s like to build something from scratch…I haven’t been that ambitious thus far, but I love the look of custom pieces.